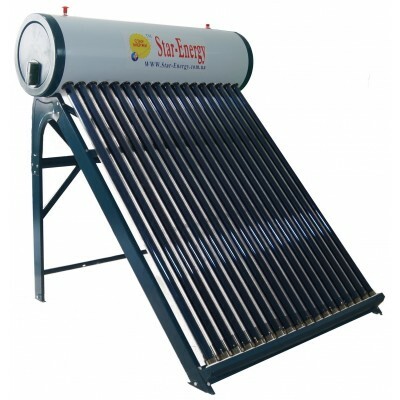 Solar collector is a device for collection of the heat energy from the Sun and for its transfer to the heat-agent. 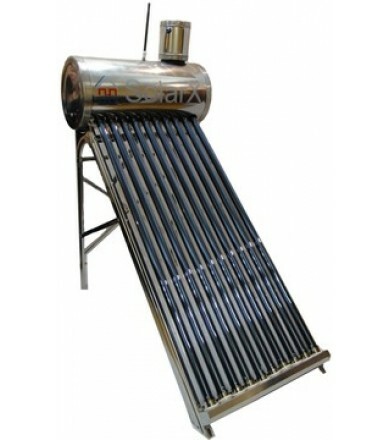 Usually they are used for the needs of the hot water supply and space heating of the premises. 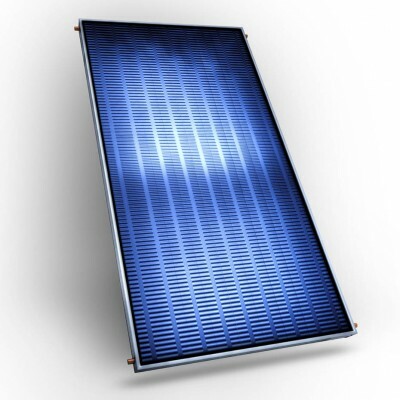 The main criteria determining the efficiency of the solar collector is the reduced optical performance coefficient. 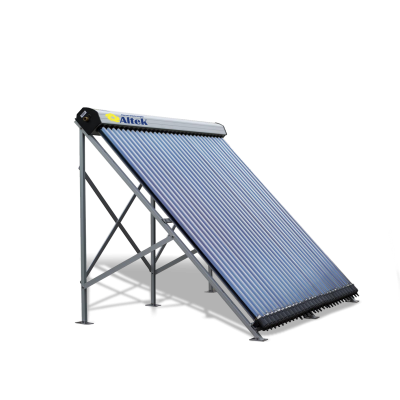 The higher it is, the more efficient the solar collector is – the more solar energy is transformed into the heat energy. 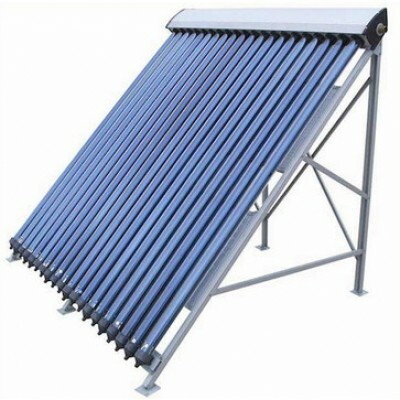 The system of the solar water-heater, additionally to the collector itself, consists of the following elements: storage tank (accumulator), circulating pump, regulating device, etc. Solar collectors are installed on the roof top (oriented to south or south-west) while other components are inside the building. Collectors heat a fluid to around 100 °C not only on sunny days but also when it is cloudy. Hot water is stored in a special accumulating tank for further use. For a single family house, a system with about 6m² of solar collectors can provide more than 60% of annual hot water demand. 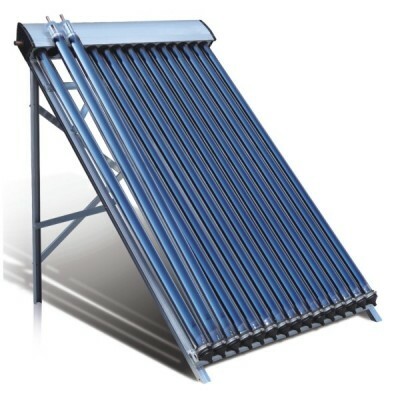 The Technology Selector contains solar collectors (flat-plate or vacuum tubes) with the reduced optical performance coefficient around 70%, as well as additional elements with the corresponding efficiency: distribution pipes with the insulation thickness not less than 30 mm, hot water storage tanks with the heat insulation of walls not less than 100 mm thick. 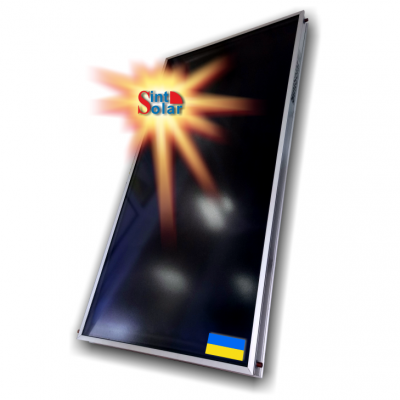 Solar collectors SOLR made by German innovative technology to industrial enterprise in Ukraine with high quality components. Which results in high efficiency of the collector. Through ultrasonic welding technology "Omega" provided reliable contact with the absorber heat exchanger, heat a large area and the lack of galvanic corrosion. 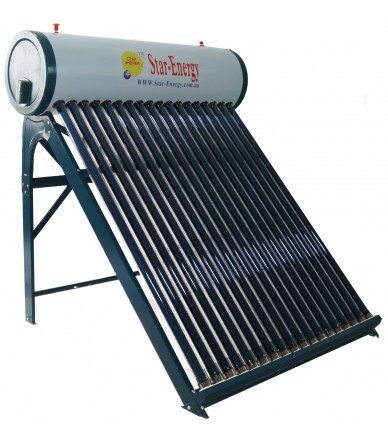 Solar water heater, non-pressure seasonal system for the preparation of hot water in the period from March to October (8 months) to a temperature of 99 degrees Celsius. Warranty: 12 months. Service life: 15 years. Savings: up to 90%. Productivity: 200 l / day. 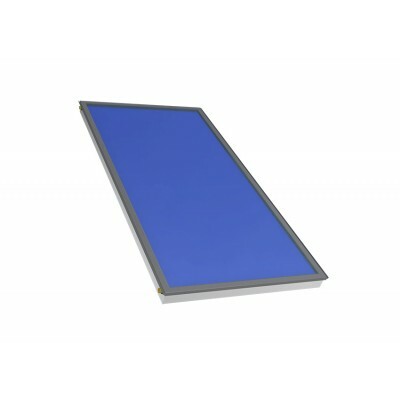 Seasonal non-pressure, thermosyphon vacuum collector SolarX-SXQG-100L-10. The volume of the tank is 100 liters (stainless steel), magnesium anode, jellied tank. The possibility of installing a heating element and a system controller. The solar collector KS2100 T AC is the optimal solution in terms of technology and price. The absorber is made of high quality materials - aluminum and copper (Al-Cu) by laser welding technology. Throught to the use of a highly selective coating (PVD), 95% of the solar energy is absorbed, and only 5% is emitted from the surface of the absorber. The use of tempered glass of the highest class U1 of solar radiation permeability contributes to a high optical efficiency of 80.2%, which is confirmed by the Solar Keymark certificate obtained from tests at the SPF Rapperswil Institute. 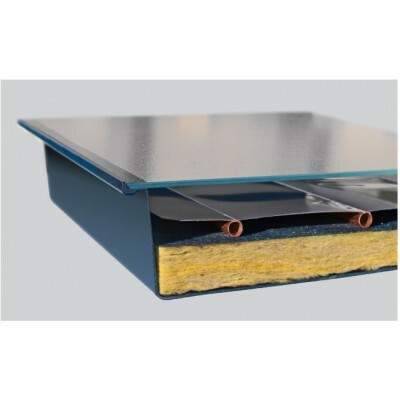 Mineral wool thermal insulation 50 mm and housing insulation 20 mm, provide a low loss of heat to the environment. 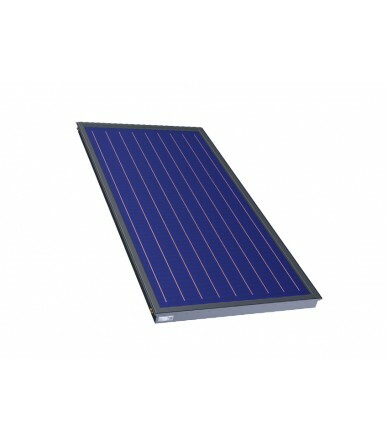 We represent the high-efficiency vacuum solar collector AXIOMA energy AX-10HP24. The capacity of this collector is 100 liters of hot water (60 degrees) per day. 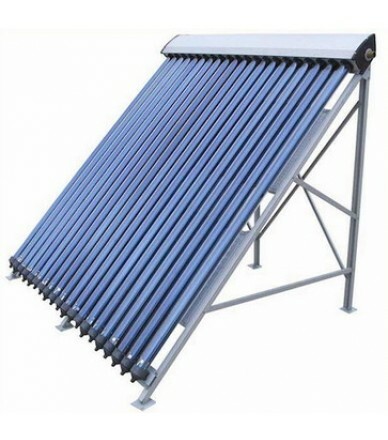 Vacuum solar collectors AXIOMA energy AX-10HP24 have an efficiency factor of 76.9%. Seasonal free-flow, solar vacuum collector. 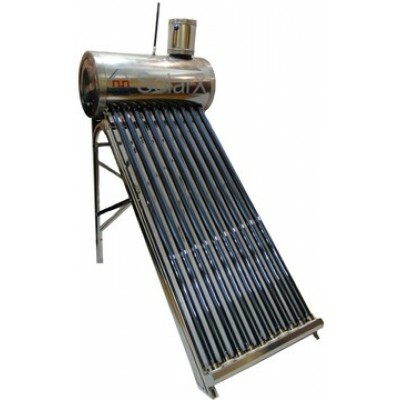 The heating capacity is 100 liters ..
FINO - a compact and very light solar collector. Due to its size and weight can be transported and FINO vstanovlyuchatis just one person. Specially designed manifold body is made of polycarbonate, it provides a reservoir high strength and allows you to install it in the snowy regions, and in regions with high wind loads. The service life of at least 30 years. Warranty - 10 years. Seasonal non-pressure, thermosyphon vacuum collector SolarX-SXQG-150L-15. The volume of the tank is 150 liters (stainless steel), magnesium anode, jellied tank. The possibility of installing a heating element and a system controller. 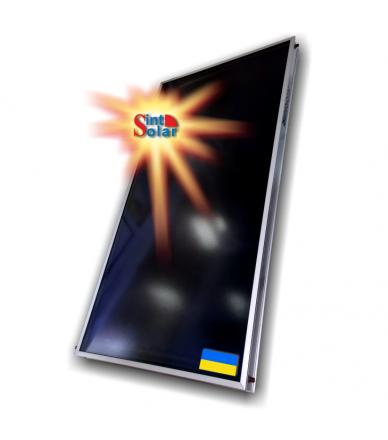 Qualitative, reliable Ukrainian flat solar collector with an effective life of 50 years and a guarantee of 10 years. Specially designed for year-round work in heat supply systems throughout Ukraine. 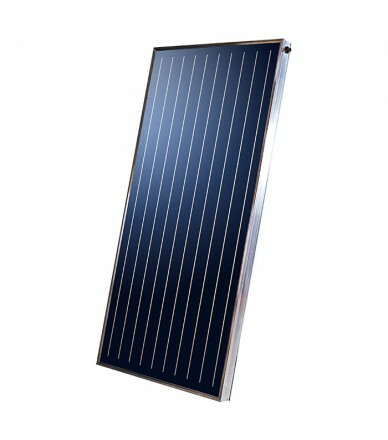 Produced since 2002 - Completely copper solid absorbent panel with the most up-to-date German absorbent coating ALANOD Eta Plus (95% / 5%), - with copper tubes a unique combination of increased area and strength, - special solar glass SOLAR with increased transparency, 4mm thick, - Strong reinforced corrosion-resistant body made of anodized aluminum and fiberglass. 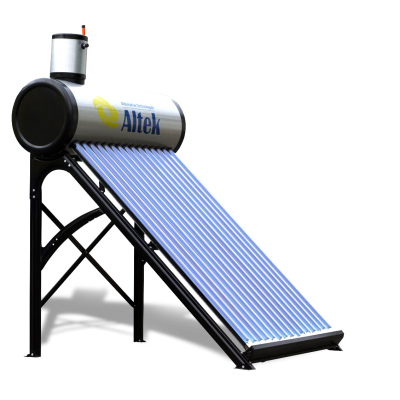 Thermo-siphon non-pressure solar collector Altek SD-T2L-10 - is the optimal solution in terms of technology and price. High selective absorber coating provides high system efficiency - 75.3%. Borosilicate multilayer (12 layers) glass of the outer tube has a high degree of sunshine. Glass withstands hail blows up to 25mm. Absorbent coating type SS-AL-Nx / Cu allows heating water in stagnation mode up to 300 ° C. Vaccum between the collector tubes retains 95% of the sun's heat. The inner tank material is 316L stainless steel. 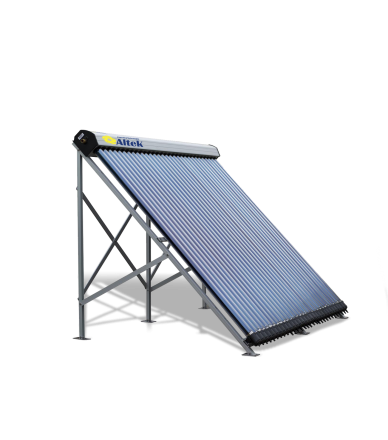 We present the highly efficient "Balcony" vacuum solar collector U-pipe AXIOMA energy AX-10U. The capacity of this collector is 100 liters of hot water (60 degrees) per day. 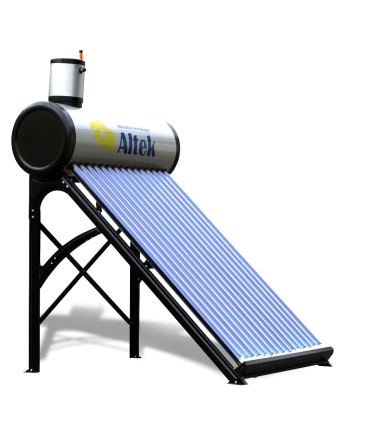 Vacuum solar collectors AXIOMA energy can work productively as the year round (when the coolant is a special non-freezing liquid (propylene glycol), and seasonally (when the heat itself is the heated water in the tank). 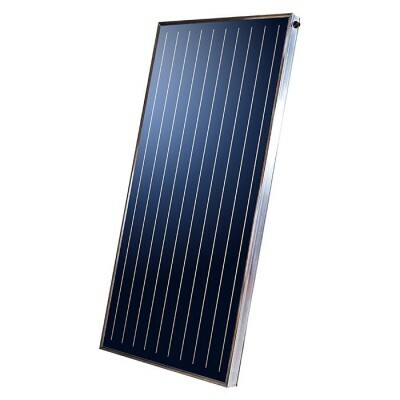 Vacuum solar collectors AXIOMA energy AX-10U have an efficiency of 79%. 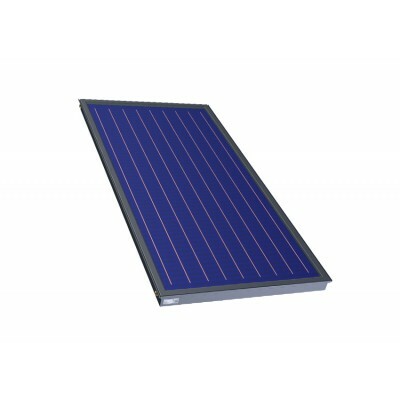 The solar collector KS2600 T AC is the optimal solution in terms of technology and price. The absorber is made of high quality materials - aluminum and copper (Al-Cu) in laser welding technology. 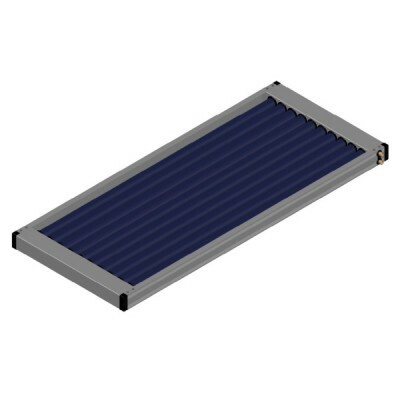 Thanks to the use of a highly selective coating (PVD), 95% of the solar energy is absorbed, and only 5% is emitted from the surface of the absorber. The use of tempered glass of the highest class U1 of solar radiation permeability contributes to a high optical efficiency of 80.2%, which is confirmed by the Solar Keymark certificate obtained from tests at the SPF Rapperswil Institute. Thermal insulation of mineral wool 50 mm thick, as well as insulation of the walls of the body 20 mm, provide a low loss of heat to the environment. DIMAS ENERGY + 20 Collectors - Premium Product With Highest Quality. The ENERGY + series is designed for the Mediterranean climate! Absorber and heat exchanger are made on the automatic welding line (GREECE). Thanks to the Laser welding laser technology, a reliable heat exchanger with absorber and a large area of heat transfer is provided. At temperature expansion of the absorber and heat exchanger there is no additional stress in the welding areas. 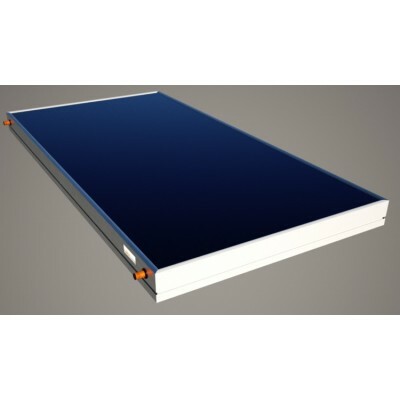 Flat solar collector with single harp absorber for thermosiphon and pressure solar systems. 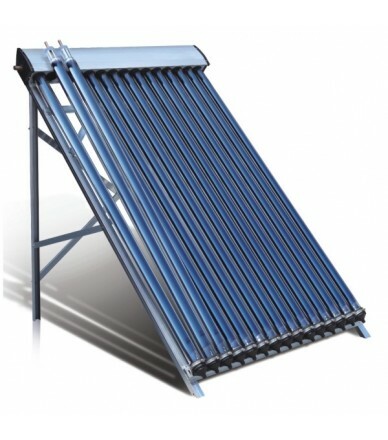 The solar collector KS2400 TP AC is the optimal solution in terms of technology and price. The absorber is made of high quality materials - aluminum and copper (Al-Cu) in laser welding technology.Throught to the use of a highly selective coating (PVD), 95% of the solar energy is absorbed, and only 5% is emitted from the surface of the absorber. The use of tempered glass of the highest class U1 of solar radiation permeability contributes to a high optical efficiency of 80.2%, which is confirmed by the Solar Keymark certificate obtained from tests at the SPF Rapperswil Institute. Thermal insulation of mineral wool 50 mm thick, as well as insulation of the walls of the body 20 mm, provide a low loss of heat to the environment. The all-season vacuum collector for heating a system with a capacity of 150 liters. Number of tubes 15. Type of vacuum tube - Heat-pipe 58 * 1800mm. Frame made of aluminum alloy. Efficiency at the level of 93%. The KS2000 TP solar collector is an uncompromising solution in terms of design and parameters among flat collectors. The absorber is made entirely of copper (Cu-Cu) by the technology of ultrasonic welding. 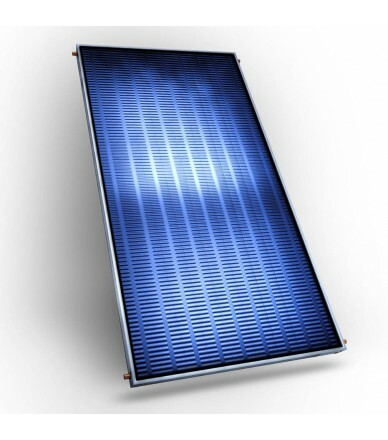 Throught to the use of a highly selective coating (PVD), 95% of the solar energy is absorbed, and only 5% is emitted from the surface of the absorber. The use of structured glass of the highest class U1 of solar radiation permeability, contributes to a high optical efficiency of 80.2%, which is confirmed by the Solar Keymark certificate, obtained from tests at the SPF Rapperswil Institute.Mineral wool thermal insulation 50 mm and housing insulation 20 mm, provide a low loss of heat to the environment. Seasonal free-flow, solar vacuum collector. The heating capacity is 150 liters ..